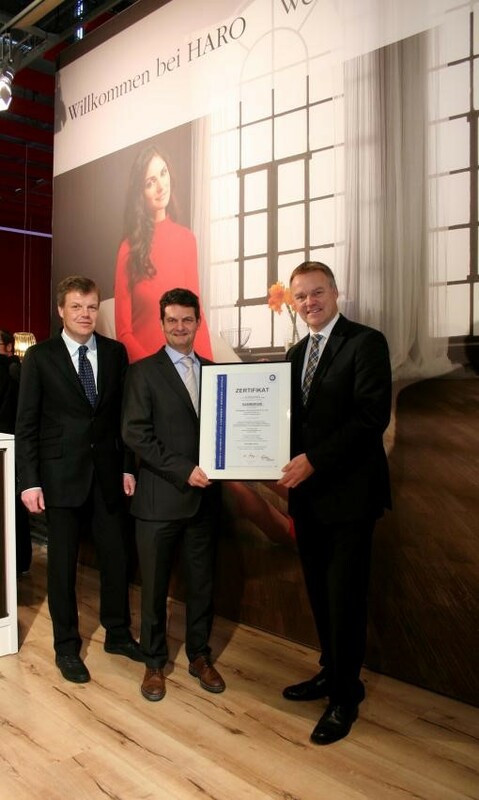 Hamberger Flooring energy management system successfully certified under DIN EN ISO 50001:2011. Rosenheim – Hamberger Flooring GmbH & Co. KG has recently completed certification of its energy management system in accordance with the new DIN EN ISO 50001 standard, which only came into force in December 2011. The introduction and implementation of the standard allows companies like Hamberger Flooring to improve their energy performance. Energy efficiency can be further enhanced by optimizing energy usage, while achieving reductions in energy costs is another important goal. Dr. Markus Nienhoff, Board Member of TÜV SÜD Management Service GmbH, presented the certificate to CEO Dr. Peter M. Hamberger in the course of BAU 2013, the world's leading trade fair for architecture, materials and systems in Munich. ISO 50 001 allows companies to develop the processes and systems that are necessary for reducing own energy consumption and increasing energy efficiency. The continuous improvement process has been firmly anchored in the standard in order to achieve these objectives. This process provides for ongoing energy conservation audits, monitoring and measurement of energy data and constant optimisation of processes alongside continuous performance reviews. Core topics in relation to the energy management system include criteria such as energy conservation and increasing energy efficiency. Any measures already performed to reduce energy consumption or increase energy efficiency have to be presented in the framework of the certification. The environment management system under DIN EN ISO 14001 was established back in 1998 in the company, which at that time was known under the name Hamberger Industriewerke GmbH. The quality management system according to DIN EN ISO 9001, which was certified for the first time in 1995 and is implemented in all production companies in the Hamberger company group, has likewise proven extremely beneficial. These certifications are also carried out by TÜV SÜD Management Service GmbH. This has led to great advances in sustainability as one of the principal objectives in the development and manufacture of flooring. All parquet, Celenio, Disano, cork and laminate flooring from the Hamberger product range are consistently produced in Rosenheim with a focus on conservation and energy savings.